Music writer and musician Hank Shteamer talks about Mosaic’s new Henry Threadgill boxed set, The Complete Novus & Columbia Recordings of Henry Threadgill & Air, for which Shteamer wrote the liner notes. In this interview, Shteamer talks about the two-decade period covered by the set; the amazing variety of Threadgill’s bands and compositions; Threadgill’s infectious humor; and how Threadgill differs from other musical iconoclasts. Get the boxed set at Mosaic’s site, and read more of Hank Shteamer’s writing at his excellent blog, Dark Forces Swing Blind Punches. Tracks used in this episode: Card Five: Open Air Suit; Come Carry The Day; Salute To The Enema Bandit; Paille Street; Noisy Flowers; Sweet Holy Rag. 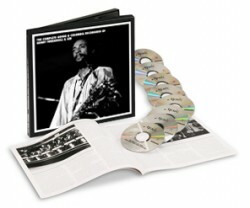 NOTE: Listen to Henry Threadgill on The Jazz Session talking about his Zooid project. Good to hear about the Threadgill box set – be nice if they could have found a way to include the first 2 Air recordings from Japan and the wonderful Nessa release. I was lucky enough to see Air at Yale in Battell Chapel right after they signed with Arista/Novus. We got to see and hear the hubkapaphone, Fred Hopkins and Steve McCall were a splendid rhythm section/partners, and the music was, yes, challenging, but so alive. Several years later, I got to the Sextett at the Village Vanguard! My friend and teacher Bill Lowe played tuba and trombone in that outfit so we drove down to NYC together. 3 great sets, raucous, funky, burlesque-like at times, but ever so enjoyable. Driving at home at 3 a.m. was a blur but a good one. Thanks as always for the good work. Are you trying to make me jealous? Well, you’ve succeeded! You and me both, Jason.